The stakes keep getting higher each book, and more and more of the world and the Gods and other mystical forces is revealed. 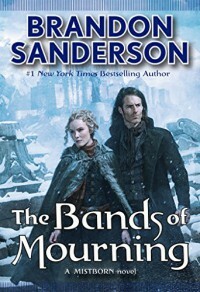 There appears to be one more book left in Era Two of the Mistborn books, and it looks like it will get more into the history and religion of the world than the previous. Each book reveals more worldbuilding. I love that each Era follows the world created through generations. The first set, ancient times, this new set, the dawn of industrialization,and I am looking forward to the next Era. It's amazing that we can follow a world from beginning to end, and see how our heroes becomes legend and Gods..and how their legend changes through generations. I like stories that shoe Gods as people, who may know a bit more than others, but still doing their best, while making mistakes.